July is a busy month on the Isle of Tiree. Some escape to the Mainland and Abroad on holiday. 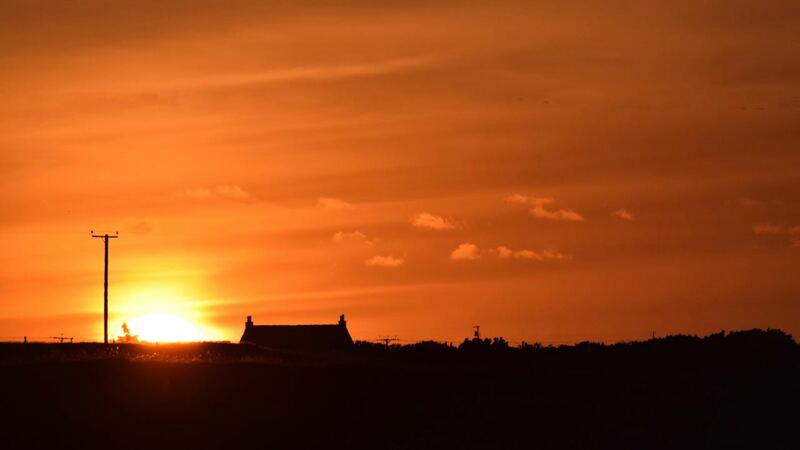 This is the week of the Tiree Fèis. 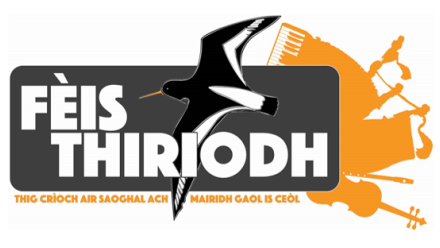 Established in 1990 to foster and promote the language, culture and music of Tiree, the Fèis seeks to re-invigorate the old ways of Tiree. Most of these traditions have been handed down through the medium of Gaelic and so the language is employed as much as possible. Complementing the classes and workshops there are ceilidhs, dances and even a film evening. Today, Wednesday, is the ever popular ‘Muse cruise’ to Barra when many join the tutors for a few tunes on board the MV Clansman. 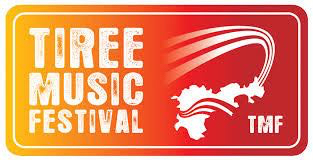 The Tiree Music Festival runs from the 15th to the 17th and already preparations are being made on the festival grounds. Articulated lorries are starting to arrive on the island with all the equipment necessary to host the event which must treble island’s population. The backdrop to this festival of national and international musical acts is the stunning Hynish bay with its beaches of shell white sand. Last year was a sell-out and so popular is the festival that CalMac have put on extra sailings. See here for additional sailings. 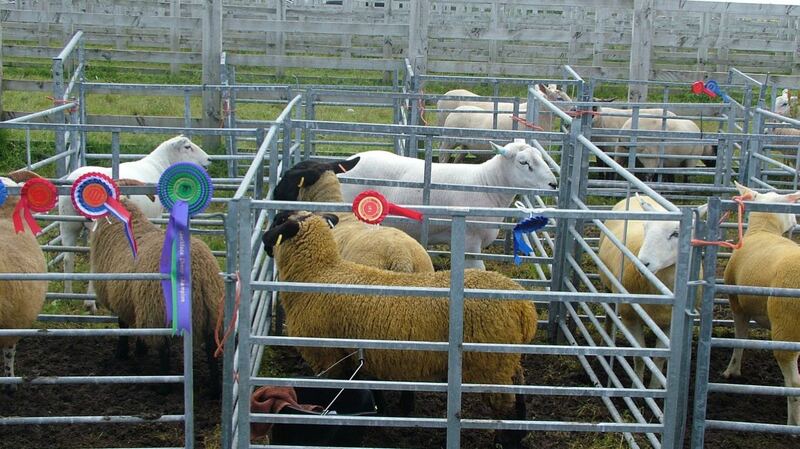 A very important date in the island’s calendar is the Tiree Show. The date for your diary is Friday 22nd. In addition to the all the normal events associated with the show there will be a series of fun sheep events to entertain in the Main Ring. We are asked to look out for “A pie, a pint and a sheep!” The Show concludes in the evening with the Argyll Ceilidh Trail Band playing at the Show Dance in An Talla. On Saturday 23rd at 3pm Tiree tractor enthusiasts gather at the Showfield and travel to the Tiree Sports at Cornaigmore before returning to the Rural Centre. Fancy a cuppa and a craic on a Wednesday morning? July 13th is the launch of ‘Coffee Pot’ in the Baptist Church at Baugh. All are welcome to this fortnightly coffee spot. Naturally tea will be available – and cakes too! 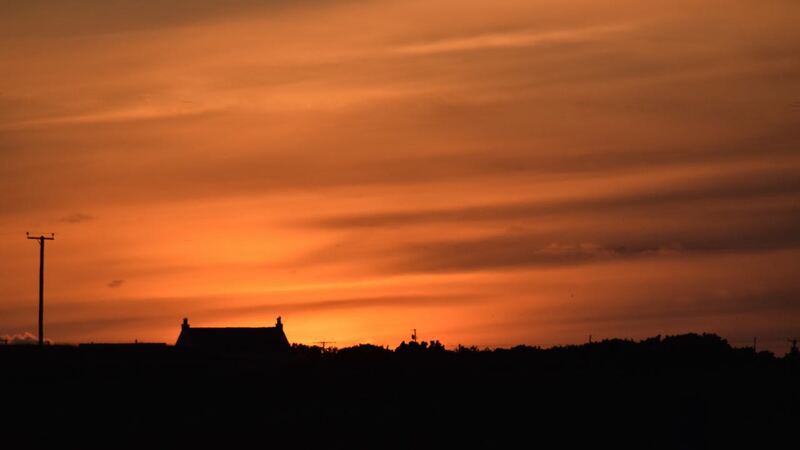 And less than a month away – a first for the Baptist Church in Scotland. A ‘Step Out’ team will be visiting Tiree, the first occasion a Team will have adventured to an island. 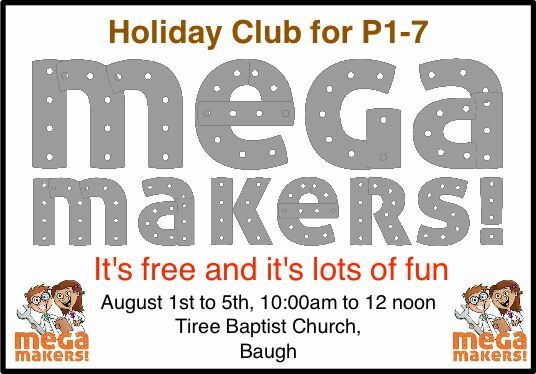 ‘Mega Makers’ is a Holiday Bible Club for Primary Age young people. “It is based on the theme of inventions and explores the vastness of God’s love using stories from Matthew’s Gospel. ” It will include games, Bible stories, crafts, singing, drama and more! It’s free and fun and starts on the 1st of August. Now all we need is ideal weather for the outdoor events.